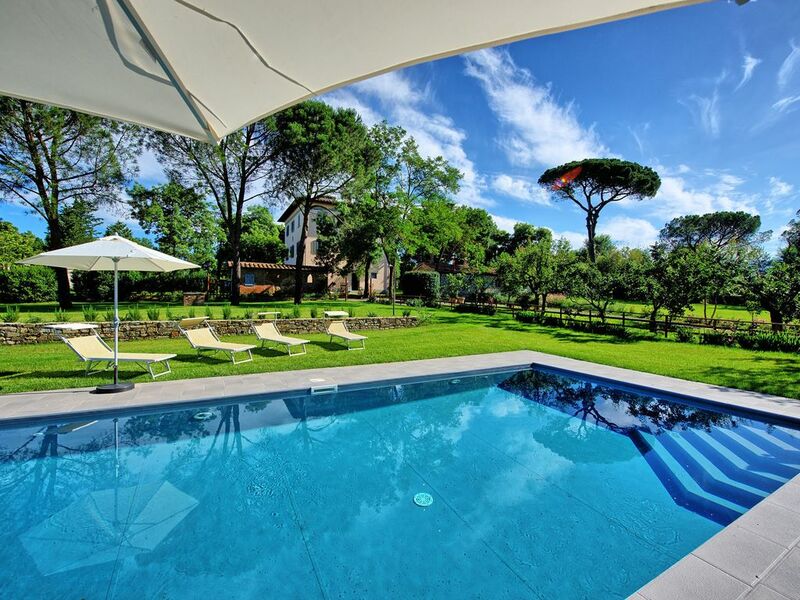 Villa with 7 bedrooms and private pool for rent in Tuscany, in the province of Arezzo. The property has just been totally renovated and is provided with welcoming indoor and outdoor areas: it has 7 bedrooms, 5 bathrooms, a large garden with private pool reserved for the exclusive use of the guests. Ideally located in the heart of Tuscany, Villa Marietta is just a short drive away from Arezzo, Castiglion Fiorentino, Cortona and Chiana Valley. Renting this villa will give the chance to our guests to live the real charme, history, culture and flavors of Tuscany. Villa Marietta is equipped with a private swimming pool where the guests can relax and spend time together, extensive gardens with barbecue for sumptuous al-fresco dinners, a lovely fireplace that will warm up the evenings of the winter months. Nice 120 years old villa with it’s charming interior. All bedrooms are good equipted, kitchen is big. Nice pool, a lot of grass, nice gardens. Bikes to ride, ping pong table. Good place to stay for big groups with kids. La villa es preciosa, muy bien arreglada, con gusto y comodidades. Tiene un gran jardín y un porche fantástico con una gran mesa. Todas las habitaciones están perfectas. Lo recomendamos.